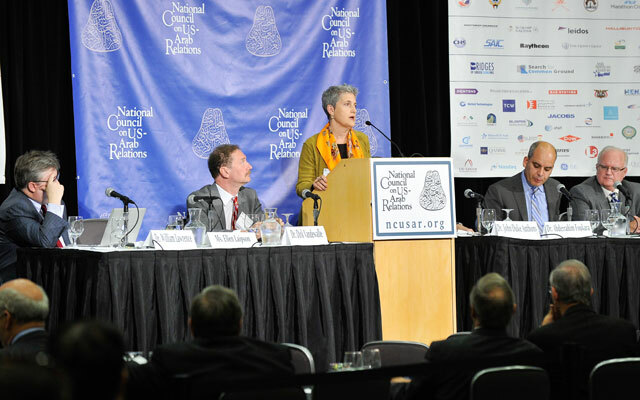 The National Council on U.S.-Arab Relations’ 23rd Annual Arab U.S.-Policymakers Conference included a session on “Arab-U.S. Energy Cooperation” that featured Ms. Randa Fahmy Hudome, Dr. Paul Sullivan, Dr. Anas Alhajji, Mr. Jamie Webster, Dr. Tamara Essayyad, and Dr. Sara Vakhshouri. Dr. John L. Iskander – Chair, Near East and North Africa Area Studies, Foreign Service Institute, U.S. Department of State. Dr. David Lesch – Professor of Middle East History, Trinity University; author,The Fall of the House of Assad, The Arab – Israeli Conflict: A History, and The New Lion of Damascus: Bashar al-Asad and Modern Syria. Ms. Mona Yacoubian – Senior Advisor, Middle East and Project Director, Pathways to Progress, Stimson Center; former Special Advisor and Senior Program Officer on the Middle East, U.S. Institute of Peace; former North Africa analyst, U.S. Department of State. Dr. Judith Yaphe – Distinguished Research Fellow for the Middle East, Institute for National Strategic Studies; former senior analyst in the office of Near Eastern and South Asian Analysis, Directorate of Intelligence, CIA. Dr. Abdullah Alshammari – Advisor, Middle East – Riyadh Represantative, ORSAM. Professor Paul Sullivan – Professor of Economics, Eisenhower School, National Defense University; Adjunct Professor, Security Studies, Georgetown University; Columnist, Turkiye Gazetesi, Istanbul, Turkey. Ambassador (Ret.) Theodore Kattouf – President and CEO, AMIDEAST; former U.S Ambassador to the United Arab Emirates and Syria. Dr. Kenneth B. Katzman – Specialist in Middle East Affairs in the Foreign Affairs, Defense, and Trade Division, Congressional Research Service, Library of Congress. Dr. Eric Davis – Professor of Political Science and former Director of the Center for Middle Eastern Studies, Rutgers University; author of Memories of State: Politics, History and Collective Identity in Modern Iraq and the forthcoming Taking Democracy Seriously in Iraq. Dr. Juan Cole – Richard P. Mitchell Collegiate Professor of History, University of Michigan; author of Engaging the Muslim World and Napoleon’s Egypt: Invading the Middle East; former President, Middle East Studies Association of North America. Dr. Paul Sullivan – Professor of Economics, Industrial College of Armed Forces, National Defense University; Adjunct Professor of Security Studies and Science, Technology and International Affairs, Georgetown University. Ms. Shameem Rassam – Media Expert and Analyst, Alhurra Television-Iraq.